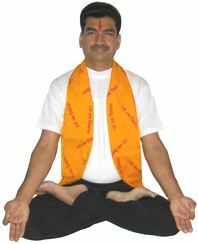 In this posture, body remains in a symmetrical position and, therefore, it is named Samasana. It is a meditative Asana. Bend the left leg in knee and place it touching the thigh of the right leg in such a way that its heel rests on the procreating organ. Keep the wrists of both the hands on the respective knees and take Dhyana Mudra. Continue normal breathing. As the backbone is kept erect in this asana, its functioning is greatly improved. Dhyana Mudra further helps in stabilizing pulse beats. Consequently strain on muscles is reduced, which in turn reduces strain on heart.